“When I was 18 I had those albums you’d escape with. When we were making the Footprintz record that was really our aim – to produce an album that kids can listen and escape to”. Released March 2013 on inimitable label Visionquest, Footprintz debut album ‘Escape Yourself’ delivers on a level that many dance LP’s aspire to reach but few attain; a ‘proper’ album with each song taking you deeper and deeper into what is an accomplished and well-rounded body of work. Every journey has its beginning, and as the opening chords of ‘The Things That Last Forever’ give way to a hypnotic bassline, you know you’re on your way. Basslines form a key part of the Footprintz sound, acting as an anchor from which vocal melodies, synth lines and warm chords weave around in an often psychedelic style. Debut single, ‘Utopia’, exemplifies this ethic with its synth flirtations and optimistic vocal musings adding layers upon a solid core. As Clarian and Addy say, “We wanted to work around a concept of escaping the confused years of growing up. 16-25, those are the years where you’re figuring yourself out, going through the motions of meeting different people and finding new things”. Tracks like ‘Uncertain Change’ and recent single ‘Dangers of The Mouth’ tackle this subject head on, focusing on the insecurities that arise from growing up. ‘Zanzibar’ takes a lighter approach, touching on the innocence of youth that brings with it, its own simple pleasures. 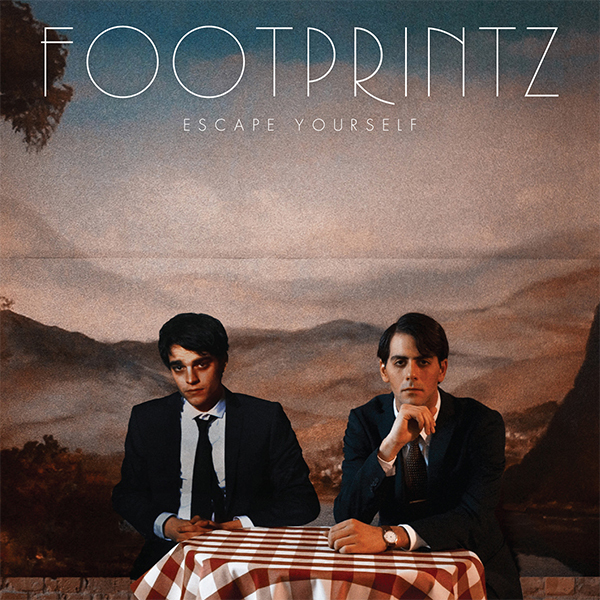 What becomes apparent throughout ‘Escape Yourself’ is a real craftsmanship to Footprintz’s songwriting. Each track reveals a little more on each listen, aided by the slick production work, done predominantly by the guys themselves in their Montreal bunker studio full of analogue equipment, odd instruments and a fridge laden with ‘special brownies’; which goes some way to explain a noirish-haze that permeates through the album. Having met at an afterparty aged 15, Clarian North & Adam Hunter have experienced most of their adult life together. ‘Escape Yourself’ distills their experiences, wraps them in a warm analogue fuzz and shares them with the listener. You join them on their journey, and deep down they hope it helps you shape your own.